In 1960 Lynchburg, Virginia, covered 25 square miles and was home to 55,000 citizens. William C. Vaughan was the mayor, Robert D. Morrison was the city manager and the city employed the Council Manager form of government. Twelve thousand men and 8,000 women were employed in a wide variety of industrial, educational, service and retail businesses. 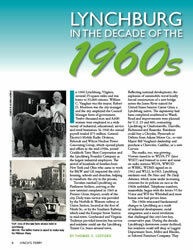 In 1960 the annual payroll totaled $75 million. General Electric’s Mobile Radio Division, Babcock and Wilcox Nuclear Power Generating Group, which opened plants and offices in the mid-1950s, joined Craddock-Terry Shoe Corporation and the Lynchburg Foundry Company as the largest industrial employers. The arrival of hundreds of families from New York and Ohio who came to work for B&W and GE impacted the city’s housing, schools and churches, helping to transform the city in the process. Travelers reached Lynchburg on Piedmont Airlines, arriving at the new terminal completed in 1960 at Preston Glenn Airport, south of the city. Daily train service was provided by the Norfolk & Western railway at Union Station, located at the foot of Ninth St., or by the Southern Railway, which used the Kemper Street Station in mid-town. Greyhound and Virginia Trailways provided intercity bus service and residents could use the Lynchburg Transit Co. buses around town. About the writer: Thomas G. Ledford was the first administrator of the Lynchburg Museum System. He retired from the city in August, 2005 after seeing the 1855 Court House restored to its original splendor.